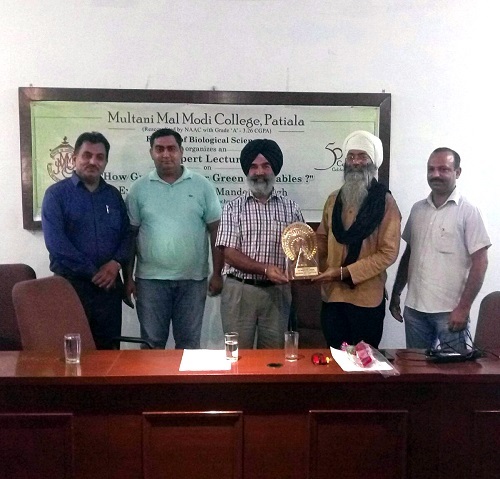 M M Modi College Patiala has planned a series of expert lecture to celebrate its golden jubilee year. Faculty of biological sciences under this program organized an expert lecture on environmental issues. 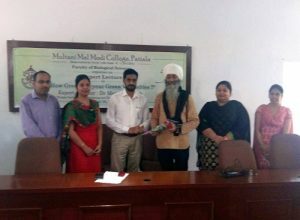 Dr. Mandeep Singh, Associate Professor form Thapar University, Patiala spoke on the topic “How Green are your Green Vegetables?” Dr. Singh expressed serious concerns on the practices of using fertilizers and pesticides for growing food grains and vegetables. He questioned the very basis of use of these chemicals which are responsible to a great extent for the diseases which we are suffering from. He talked about some practical options available to the general public for avoiding the consumption of poisonous fruits and vegetables. Principal Dr. Khushvinder Kumar shared his deep concern for the drastic fall in the water table and the level of adulteration in the agricultural produce. He urged the students to be conscious of the dangers of using excess chemicals and remain committed to the environmental concerns. Dr. Ashwani Kumar Sharma, Dean Biological Sciences introduced the expert speaker and his achievements as an academic and social activist. Dr. Kuldeep Kumar proposed the vote of thanks.